You say that because that’s what we most often think of when we hear the word butter. We think of that fatty cream that gets churned and churned until it’s a nice yellowy spread perfect for our muffin or roll. But there’s more than one kind of butter. There’s actually dozens. There’s all the different dairy-based butters, which includes the uncultured, sweet cream butter we most commonly eat, and then there’s all the other butters that fall outside traditional dairy spread. 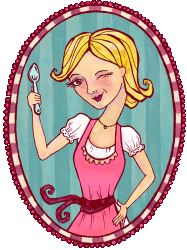 Nut butters, fruit butters, vegetable butters, cocoa butter (from the cocoa bean), etc. I could go on and on. For the sake of this post, though, we’re talking about that famous dairy spread. Are you ready for this? 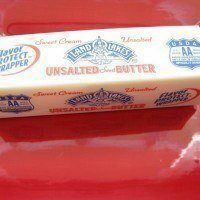 Check out some of the different butter varieties. Cultured butter: Made from fermented cream. Raw cream butter: Butter made from unpasteurized cream. Clarified butter: Pure butterfat made with high heat. Whipped butter: Aerated for a fluffier texture. Uncultured or sweet cream butter: Made from pasteurized fresh cream. The type of butter most Americans are used to eating. Butter doesn’t always come from cow’s milk. It can be made from any fatty milk, including sheep’s milk and goat’s milk. Also keep in mind that some of these butters can be salted or unsalted. Get this. Butter is basically heavy whipping cream whipped for 15 minutes (or so). Toward the end of the whipping process you’ll need to drain the excess liquid, rinse, add a pinch of salt, if you prefer, and then return to your whipping until you have the texture you want. And that’s it. Butter is really just a matter of muscle power, or electrical power if you’re lucky enough to have a stand mixer. Turns out you can throw just about anything into butter to make it wonderful. 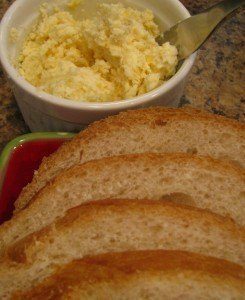 I followed the advice on Cooking with Caitlin and made corn butter–a huge hit at my baby shower. All you need is the corn from one cob (I had my mom bring Iowa sweet corn) blended with 6 tbsp. butter and a dash of sea salt. Try on fresh bread or even on grilled corn. I’ve also seen recipes for mango butter, pumpkin butter, tomato and basil butter, and so many more (I can’t wait to make these! ), all of which are simple and only call for the fruit or vegetable, butter, salt, and one or two seasonings (maybe). If you want to stay truer to actual butter, then go basic by adding an herb or two only. I took a stab at thyme and garlic butter. It’ll keep in the fridge for for up to one week! So, I made the garlic and thyme butter and decided to deconstruct it into a sauce, because, um…I prefer sauce. If I told you I melted the butter in a sauce pan, tossed in some al dente ziti, and then served it over asparagus and a chicken breast, would you believe me? I hope so, because I don’t have a picture. Bottom line: Butter sauce is simply melted butter with whatever other ingredients you want. Like this Steamy Kitchen butter sauce featured on Tasty Kitchen. What types of butter do you make? What a great post! Very interesting and informative. Loved it! I love baking with butter…and spreading some on my fresh loaves of bread! I want to try making my own now…and adding in some fresh herbs or special salts! Very interesting post! I am a salted sweet cream butter girl myself. I remember my grandmother talking about churning butter when she was a little girl. Thank goodness for King Soopers! @ Lea Ann – I guess I haven’t seen you in awhile! I’m due November 25. I probably won’t stop thinking about butter today because of this post. I landed some ‘hen of the woods’ mushrooms that need a little butter-love.